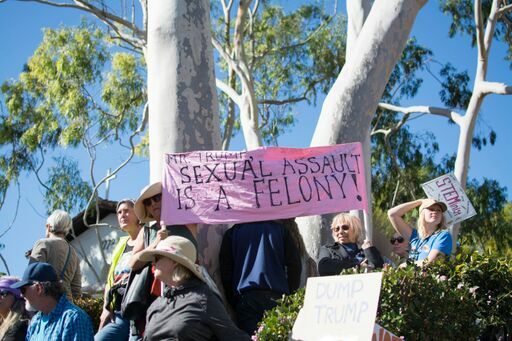 The San Luis Obispo Women’s March is joining the nationwide #WhyIDidntReport movement by hosting a solidarity event Wednesday, Sept. 26 in front of San Luis Obispo Superior Court from 4:30 p.m. to 6 p.m. Following the #MeToo movement, the hashtag began as backlash to President Donald Trump’s response to a woman who recently accused Supreme Court nominee Brett Kavanaugh of sexually assaulting her when they were in high school. In a recent tweet, Trump questioned why Christine Blasey Ford had not filed a police report regarding her sexual assault claims against Kavanaugh or made the allegations sooner. One in four women and one in 10 men are sexually assaulted by the time they graduate college, according to Cal Poly’s Safer. According to the Department of Justice, seven out of 10 survivors of sexual assault never report it to the police. Trump’s tweet is an example of the stigma surrounding not reporting sexual assault directly after it allegedly occurs. Nationwide, the tweet evoked a ‘walk-out’ on Monday, Sept. 24. Women across the nation were encouraged to wear black, hold a ‘walk-out’ and post #BelieveSurvivors on social media, according to a Facebook page hosted by 24 different advocacy groups. Women’s March San Luis Obispo is also standing in solidarity with Ford to allow others to be heard through Wednesday’s event. They are encouraging people to bring signs to the event in support of survivors of sexual assault. “We want to send out a strong message that we believe survivors and that we one hundred percent support them,” event organizers wrote in a news release. For more information about the event, visit their Facebook event page.